Named after a secluded Cornish harbour, four-bedroomed Mullion Cove is reminiscent of a quaint English beach house (although in this case, more of a hill house), with the added appeal of some fine contemporary touches. The soft cream-coloured sofa suite and dark wooden dining table in the vast living area lend an air of gentle tradition to an otherwise crisp, modern residence, and the recessed library is a delightful place to sit with a cup of tea and a novel - the perfect afternoon retreat. Mullion Cove has been recently refurbished (July 2010) and everything is brand new, but the slide-open, spacious design with cool tiled flooring is very practical; you can pad around barefoot without fear of damaging anything and kids can come and go from the pool and garden with ease. Sun worship is certainly no challenge, while the addition of an oversized sala (gazebo) offers a fan-cooled retreat between tanning sessions. It is also a superlative spot for snacks, chats, page turning or web browsing on the free WiFi, comfortably perched before the 180-degree sea views. 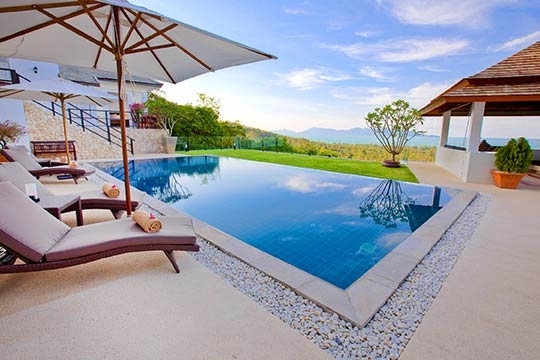 The lawn beyond the pool, though not vast, is great for children to mess about on or for an intimate social gathering. 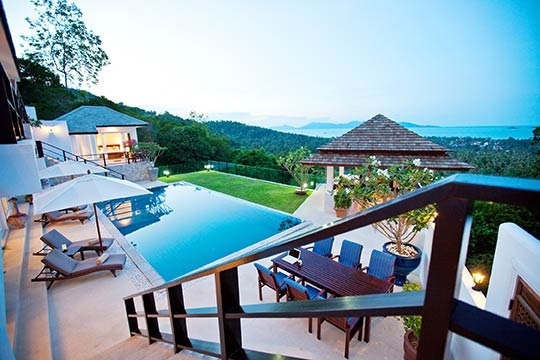 It also forms a reassuring barrier between the pool and a steep hillside drop off (hence the owner’s ‘sky’ garden description) which can be a concern in other Samui hillside villas. Attentive but discreet staff make sure you're glass is always full and the option of an in-house chef (charged extra, plus provisioning) to prepare meals from an eclectic suggestion menu of Thai and western treats will keep the wolf from the door. Post dinner sloth can be guiltlessly enjoyed in the air conditioned comfort of the living room, either reading in the library space or watching movies on the huge plasma-screen TV. Alternatively, you can head back out to the sala for games and conversation with a backdrop of twinkling beachside villages. As the night drifts on, tired souls can retreat to the quiet comfort and privacy of their respective bedrooms for a satisfied, peaceful sleep. 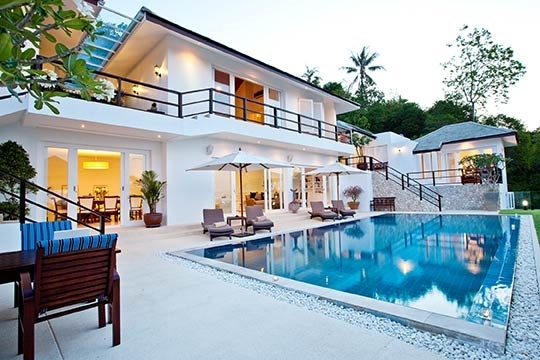 The villa is far enough from Bo Phut to be blissfully quiet, yet close enough for an evening out if the need for some added diversion takes hold. 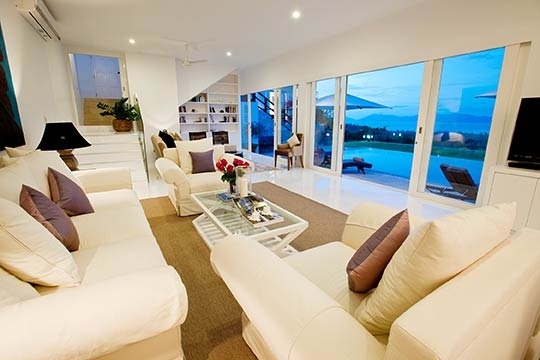 Mullion Cove is the highest in a row of five private villas, backed by a steep road that climbs the hillside a couple of kilometres into the hinterland behind the village of Bo Phut. 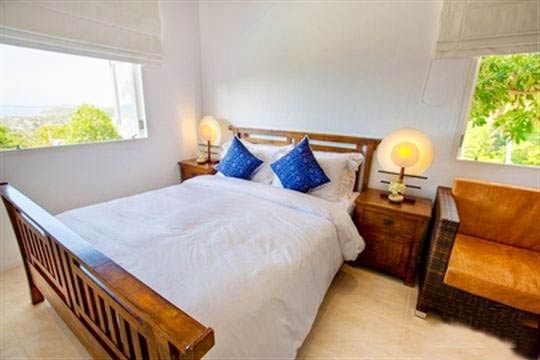 The property enjoys a quiet location with unobstructed sea views, but there are no amenities close by so a hire car is required for outings and excursions. Tropical vegetation and palm groves cover the surrounding hillsides which are punctuated by the occasional holiday villa. From the private car park, you enter Mullion Cove on the upper floor of the main living and sleeping pavilion, with views from the entrance straight down to the shimmering coast. 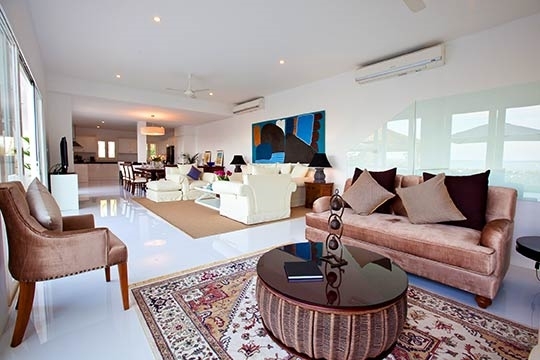 Two double bedrooms (one left, one right) occupy this floor, connected by a glass-walled terrace that runs the length of the building with steps at either end leading down to the lounge, dining room, kitchen and outdoor pool area. The right-hand guest bedroom is compact but comfortable, with an attractive dark wood queen-sized bed, built-in storage and ensuite shower. 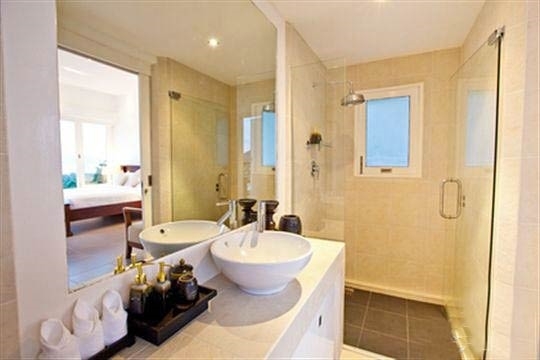 To the right, the spacious, king-bedded master suite boasts a sofa and coffee table, plus a wall-mounted flat-screen TV for bedtime viewing and a large ensuite with moulded stone bath tub and separate rain shower cubicle. Electronic black-out curtains shield you from the morning sun. Left of the master suite, stairs from the terrace feed off half way down to the poolside. 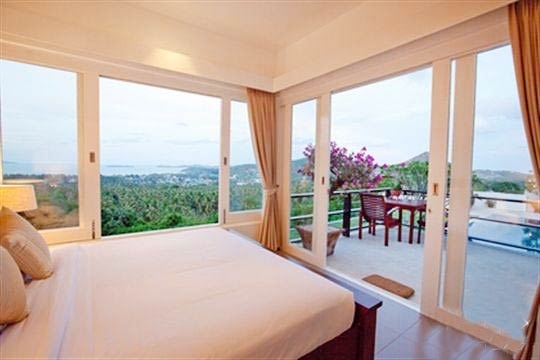 Here, two more connected bedroom pavilions (both queen-bedded) have their own private sea view terraces and also boast stone bath tubs and shower rooms in their ensuites, with shuttered windows that open onto the tropical scenery. 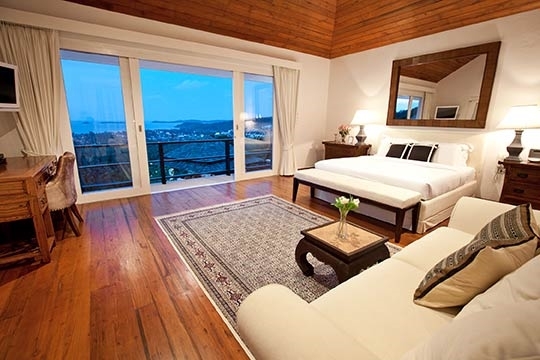 In the front pavilion the bed sits right by a picture window offering breathtaking views right from your pillow. 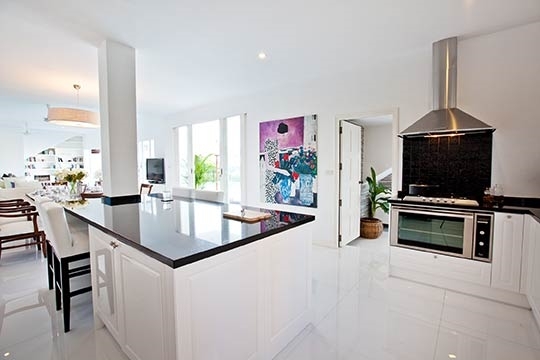 An inviting 16m pool and lawned ‘sky’ garden fronts the open-plan living, dining and kitchen space. Cool, cream décor and furnishings with colourful wall art give this spacious room a light, summer feel. The sofa suite takes centre stage, facing a large plasma-screen-TV with satellite and DVD, while an additional recessed library adds a relaxed ambience. 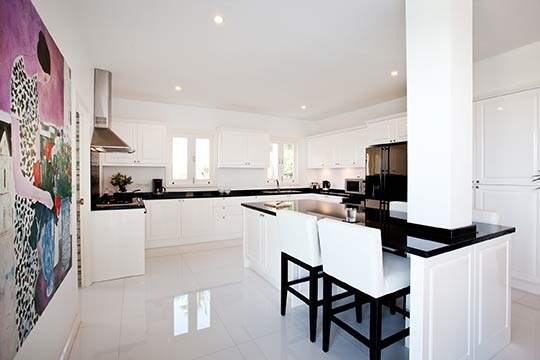 The fully-fitted, modern kitchen at the far end of the room surrounds a generous island breakfast bar and also serves the eight-seater dining table where breakfast (included) is laid out every morning. 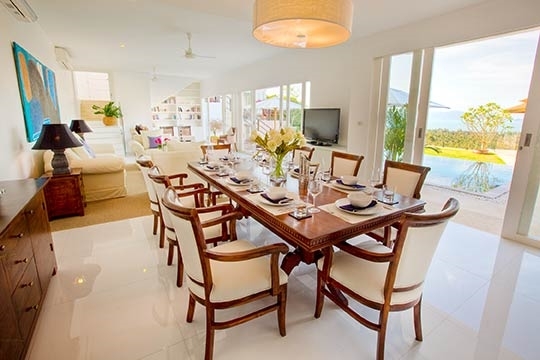 Meals can also be taken in an enormous, furnished, fan-cooled sala that sits right on the edge of the property, overlooking the coastal backdrop. 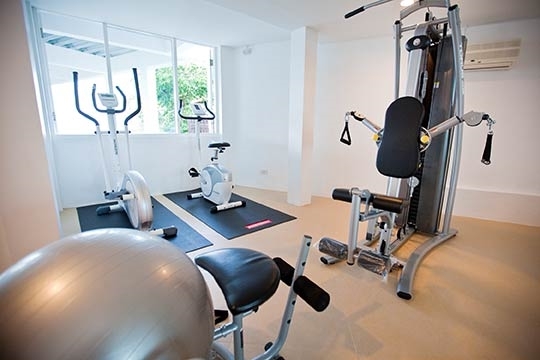 To the right of the sala, more steps lead down to a third level where staff quarters and a modest, but well-equipped gym with its own ensuite bathroom are hidden from the rest of the villa, overlooking a sloping hillside garden. 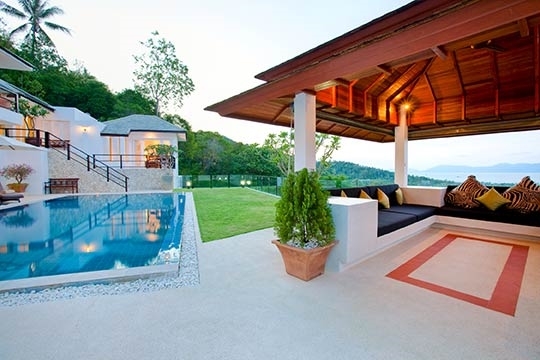 Lower rates are sometimes available for this villa if only 3 bedrooms are rented. Contact Customer Service for details. 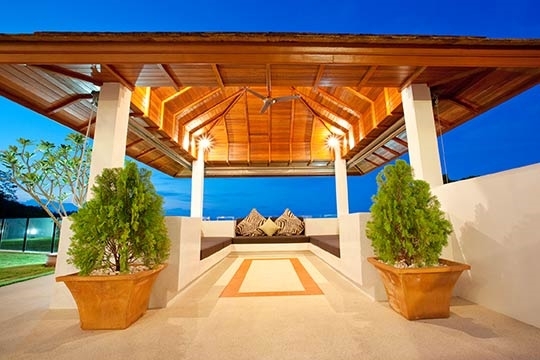 4 bedroom villa located in Bo Phut, Koh Samui. Ideal for Beach in ten, Body and soul, Bring the relatives, Gastronomic delights, Going for golf, Fair share for groups, Party pads, Room with a view.